When I saw this recipe my first thought was “well that’s an interesting combination”. Spaghetti and meatballs is obviously a pretty classic Italian (and American) dish that we’re all very familiar with, but just like sausage, meatballs are a common recipe among many difficult cuisines. So why this was the first recipe I found with an Asian take on it is beyond me, but I am definitely glad I found it as it was a nice combination of your traditional Asian stir-fry and your traditional red spaghetti sauce and meatballs. 1. Preheat the oven to 400 degrees. Line a baking sheet with foil and top with a wire rack. Spray the rack with non-stick cooking spray. 2. In a large bowl combine the ingredients for the meatballs and form into 20-25 meatballs. Place each meatball on the wire rack. 3. Bake for 12-15 minutes or until cooked through. 4. Meanwhile, combine the sauce ingredients in a small bowl. Set aside. 5. Prepare the lo-mein noodles according to package directions. Drain and set aside. 6. Heat the canola oil in a large skillet over medium heat. Add the whites of the green onions, peas, mushrooms, pepper, garlic and ginger. Cook for 5-7 minutes or until vegetables are tender-crisp. 7. Add the sauce to the skillet and stir frequently until it begins to thicken, then stir in the sesame oil. 8. 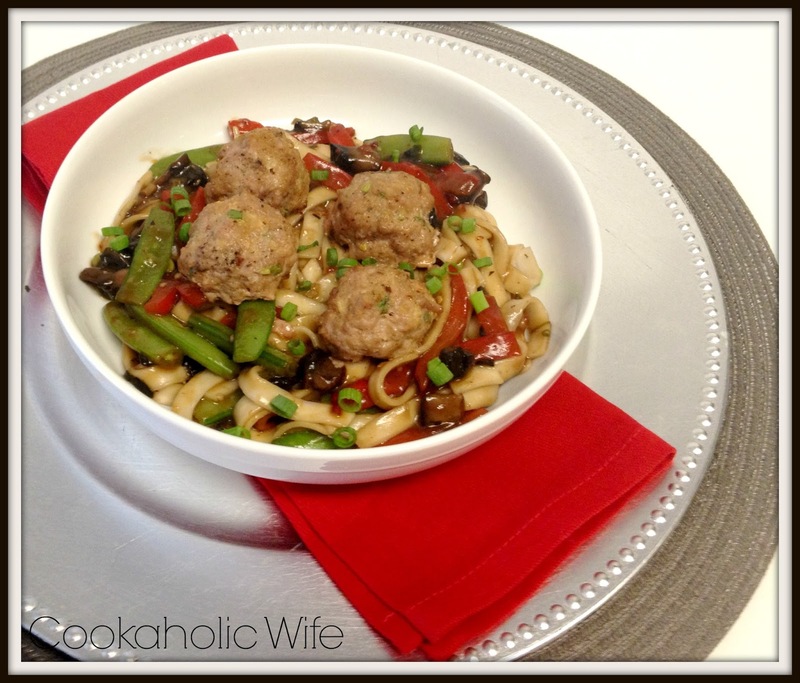 Stir in the noodles and serve noodles and vegetables with meatballs on top. Garnish with the green onions. I know this looks like a lot of ingredients and a lot of steps, but this came together fairly quickly. If you needed it for a quick weeknight meal, you could easily assemble the meatballs (and even cook them) beforehand. The lo-mein noodles cook in just a few minutes as do the vegetables, so the meatballs are really the longest and most time consuming part of this dish. I really like the way all of the flavors paired together. Yum! I always love Elly's recipes!